Systems of financial support for old people are experiencing serious financial difficulties worldwide and the old-age, disability, and survivors’ pension system of Cuba (the pension system from now on) is no exception to this trend. 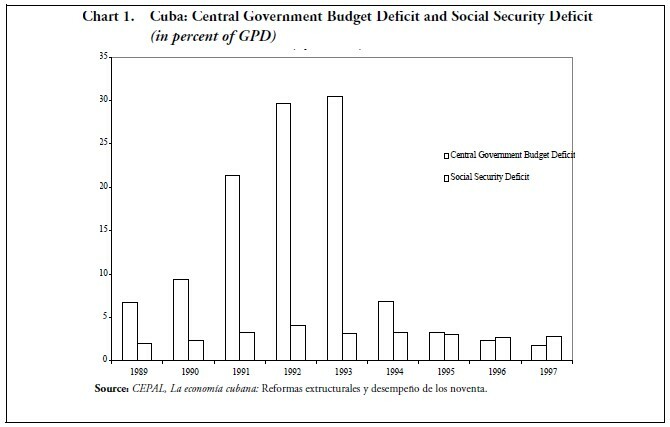 The pension system of Cuba has been extensively discussed in the literature by Mesa-Lago (see below) and it has also been analyzed in the 1994 and 1995 ASCE conferences by Buttari; Alonso, Donate-Armada and Lago; and Donate-Armada. 2 The objective of this paper is to analyze the current situation of Cuba’s pension system; to review the proposals that have been advanced in the literature in recent years to strengthen the finances of pension systems throughout the world; to assess the experience of transition economies in reforming their pension systems; and to draw preliminary policy recommendations on how to reform the Cuban pension system. The first section of the paper presents the main characteristics of Cuba’s pension system: how it has evolved over the years, its coverage, the level of benefits, sources of financing, and the financial problems experienced in recent years. The second section reviews the recent literature regarding pension economics and reform proposals to address pension system problems, while the third reports on the pension reform experience of transition economies. The fourth section presents the paper’s conclusions about possible reform initiatives for the Cuban pension system. The revolutionary government of Cuba carried out a number of important reforms in the pension field. By 1962 a process of unifying the benefits and contribution rates of existing programs had been completed. A 1963 law widened the coverage of the pension system to all the salaried labor force and made the financing of the system a direct responsibility of the government. Between 1964 and 1983 the coverage was made pretty much universal as other groups of workers were incorporated into the pension program: the self-employed, small entrepreneurs, members of agricultural cooperatives, and small farmers that gave up the titles of their lands to the state. The armed forces and members of the internal security apparatus of the state were the only groups that were outside the general program, enjoying more generous pension benefits. 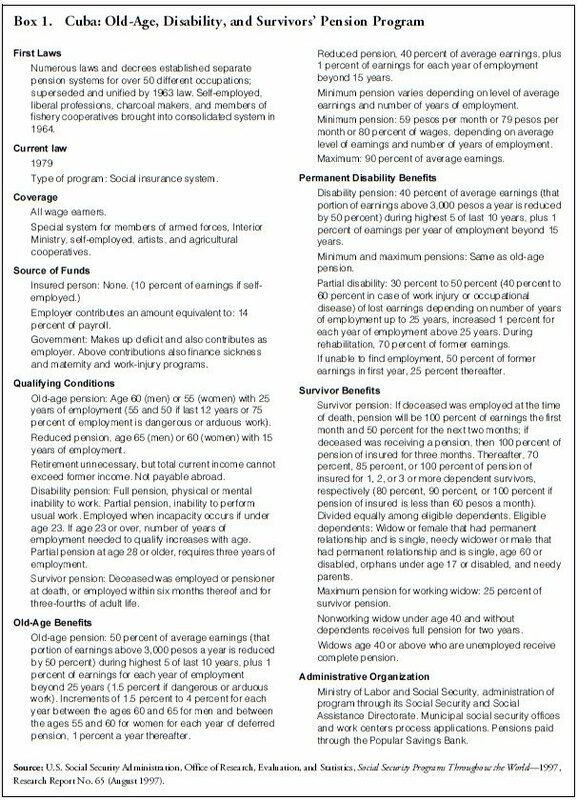 The retirement age in Cuba is currently 55 years for women and 60 years for men with 25 years of employment (Box 1). If the last 12 years of employment (or 75 percent of the total work period) is in dangerous or arduous work, the retirement age becomes 55 years for men and 50 years for women. There is a reduced pension (at 65 years for men and 60 years for women) with 15 years of employment. The retirement age in Cuba is lower than in most countries in Latin America (Table 1) which, combined with a higher life expectancy than in most Latin American countries, results in longer retirement periods.5 The retirement pension is equivalent to 50 percent of average earnings during the highest five of last ten years of employment (the portion of earnings above 3,000 pesos a year is reduced by half for purposes of this calculation), plus 1 percent of earnings for each year of employment beyond 25 years. Pensions increase between 1.5 percent to 4 percent for each year of delayed retirement between the ages of 60 and 65 for men and between the ages 55 and 60 for women and 1 percent a year thereafter. The maximum pension is 90 percent of average earnings. The pensions are not indexed. Members of the armed forces and the internal security personnel have a privileged system. They can retire with 25 years of service, there is no minimum age requirement, and a more generous average salary base is used to calculate pensions. On the other side of the spectrum, the self-employed have a less generous pension system. 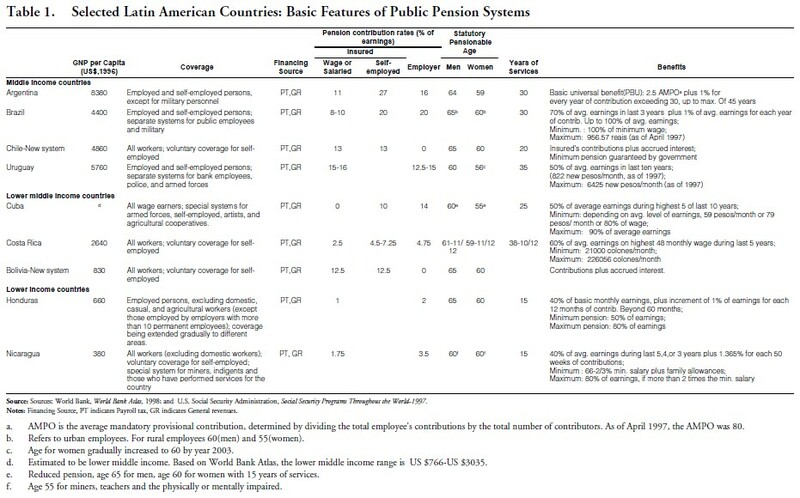 Cuba’s pension system is a defined-benefit, pay-asyou- go system (PAYG). Employers (i.e., the government, public enterprises, and some limited number of private enterprises) currently pay 14 percent of the wage bill to finance pension benefits. This is significantly lower than what was charged in other centrally planned countries in the early 1990s at the beginning of their transition period. Employees do not have to pay, while the self-employed pay a tax equivalent to 10 percent of their earnings. Given that almost all of the economically active population is employed by the state, in principle there should not be a serious problem of tax evasion. The central government covers the cash deficit of the pension system and the pension tax payments are part of the general tax revenues of the central government. Old-age and survivors’ pensions account for over 80 percent of the payments, and disability payments for the rest. At the same time, social security revenues increased from 676 million pesos in 1989 to 985 million pesos. As a result, the cash deficit of the pension system grew from 417 million pesos in 1989 to 712 million pesos in 1997 (equivalent to 2.7 percent of GDP) (Chart 1). In the latter year, the cash deficit of the pension system was greater than the overall budget deficit of 470 million pesos. The large estimated deficit for 1997 is rather surprising because if the contribution rate is 14 percent and the dependency ratio is 1:4 (see below), then in principle, the system should be able to provide an income replacement rate of 56 percent (more than the pension for a person retiring after 25 years). It is true that the replacement rate of the maximum pension is 90 percent and that about 20 percent of the contributions go to pay disability pensions, but still the deficit of 712 million pesos appears to be on the high side unless most of the pensions are closer to the 90 percent replacement rate. An actuarial evaluation of the pension system also confirms the lack of viability of the pension system under the current rules. Donate-Armada has calculated that contribution rates from current active participants of the pension system need to be increased sharply to finance both existing old-age retirement pensions and their future old-age pensions.7 With reasonable assumptions about interest rates, salary increases, and the rate of inflation, combined with the assumption that the pension rules will not change, he estimated that the contribution rate would have to increase in 1995 from 10 percent (the rate prevailing at that time) to 36 percent. The contribution rate was calculated as the ratio of the actuarial present value of future old-age pension payments to the actuarial present value of salaries of the current participants of the system. A contribution rate of 20 percent was needed to pay the current pensions with the additional 16 percent being required to accumulate a fund to pay future pensions of current active participants. Based on 1997 data, a contribution rate of 24 per cent (assuming no decline in compliance) would be required simply to eliminate the cash-flow deficit of the system, without accumulating any prefunding. Another factor that will cause the financial situation of the pension system to worsen is the aging of the population. Mesa-Lago has estimated that the population of retirement age will reach 1.82 million in 2000 and 2.34 million in 2010, compared with 1.45 million in 1990 and 0.68 million in 1960.8 As a result, the ratio of economically active to economically inactive of the working age population would drop from 4:1 to 3:1. Unless reforms are adopted, these changes will undoubtedly worsen the financial situation of the pension system. In these circumstances, as suggested by Mesa-Lago, one can get an idea of the purchasing power of the pensions by converting them to U.S. dollars and comparing them to U.S. dollar prices in the informal market. For the end of 1995, CEPAL reports a black market exchange rate of 25 pesos per U.S. dollar and 7 pesos per U.S. dollar at the end of 1990. Using these exchange rates, the maximum pension declined from US$24 in 1989 to US$7 in 1995.11 These are very low levels of income compared to reported dollar prices of basic necessities in Cuba, confirming the sad reality that the pension levels cannot provide pensioners with a minimum standard of living. To sum up, the existing pension system in Cuba fails to provide a minimum level of income for pensioners to buy the basic necessities of life. It is true that medical care, which is one of the largest expenditures categories for the aged is provided essentially free of charge (although the availability and quality of health care also has deteriorated sharply in recent years) and housing is provided at very low rents. Nevertheless, it is clear that the pension system is a meager system, which is already running large cash deficits and is building a large contingent liability for the government. The next sections discuss key issues in pension economics, proposals that have been advanced to reform pension systems, and the experience of the former centrally planned economies in addressing their pension problems. Income insecurity in old age is a worldwide problem. In industrialized and semi-industrialized countries, this has manifested itself in the difficult financial situation that pension systems have faced in recent years and in the rising amount of resources spent on pensions as the populations grow old, which have been documented in a study by the World Bank.12 In poor and less urban societies of Africa and Asia, where the old make up a smaller part of the population and are cared for by extended family arrangements, mutual aid societies, and informal mechanisms, it tended to be lesser of a problem for a while. However, as urbanization and mobility increased in these countries the extended family ties and informal systems started feeling the strain. This strain has been felt most in countries where the proportion of the old has been growing rapidly as a result of declining fertility and improved medical care. There is an urgency in these countries to set up formal systems of income maintenance, while helping to maintain informal arrangements of protecting the poor. Latin America and the former socialist countries of Europe and Central Asia have been forced to reform formal pension systems that had been in operation for a long time. Liberal pension benefits, including early retirement provisions, required high contribution rates which, in turn, have led to large contribution evasion and other distortions in the labor markets. The labor market distortions reduced productivity, pushing contribution rates and evasion still higher, even as limited long-term saving and capital accumulation further dampened economic growth. 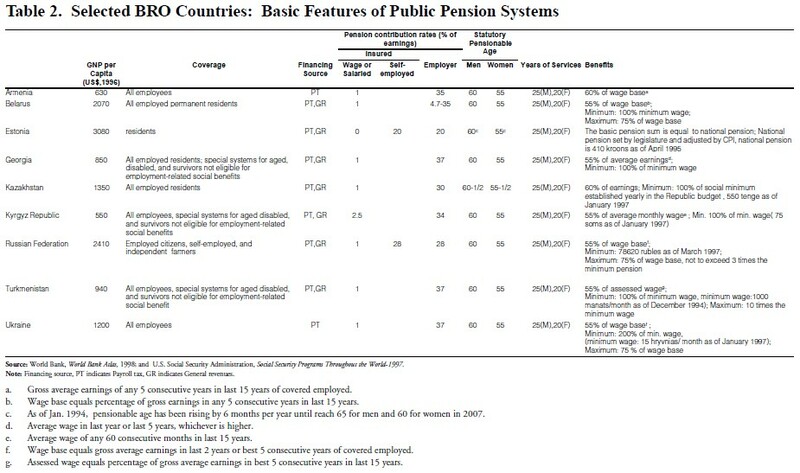 These countries have not had any alternative but to cut the benefits of their pension programs. In addressing the problems of providing a retirement income for the old, it is generally recognized that governments need to play an important role, including in countries that until now have relied on informal arrangements to provide old-age security. Governments need to take actions to provide old-age security because people can be shortsighted and may not save enough for their old age, with the result that they could become a burden on the rest of society. In many countries, there may also be inadequate saving instruments because capital markets are underdeveloped and macroeconomic conditions unstable, justifying government intervention. Insurance market failures are other problems that arise, particularly in poor countries—adverse selection, moral hazard, and correlation among individuals make insurance against many risks (such as the risks of longevity and disability) unavailable. Another important problem is that there might be information gaps regarding the solvency of insurance and other type of financial institutions, or about the relative profitability of alternative types of investment which might result that serious mistakes are only discovered late in life with dire consequences. Most countries have tried to fulfill the saving, redistribution, and insurance objectives through a publicly managed scheme that pays an earnings-related defined benefit and is financed out of payroll taxes on a pay-as-you-go basis, similar to the Cuban system. In these schemes, some of the contributions of the richer people go to help pay the pensions of the poorer. The system forces the workers to save part of their income and they are protected against disability and other risks. The combination of functions in one program has been defended on grounds that it keeps administrative costs low through economies of scale and builds political support for the program. However, experience has shown that governments tend to succumb to the temptation of providing too generous benefits to pensioners at the beginning of these programs. Later, governments try to cover the costs with increases in contributions, which result in tax evasion problems and increases in the size of labor market distortions mentioned above, particularly in developing countries that have less efficient tax administration. The fact that older workers tend to retire earlier than they would do if they had less generous benefits also complicates the situation. Eventually, the costs in terms of higher taxes and their distortionary effects become too large to bear by the countries following these policies. In some developing countries, partially funded defined benefit systems also have a record of misuse. In these countries, the pension funds have been required to invest solely in public securities, which yield very low returns. The availability of this inexpensive financing have led governments to borrow and spend more than they would have otherwise in unproductive ways. This practice results in a hidden tax on labor and deprive the private sector of access to funds and thereby inhibit economic growth. Moreover, it has been argued that PAYG systems also miss an opportunity for capital market development. In a PAYG system, when the first old generation gets pensions that exceed their savings, national consumption may rise and savings decline. The next generations pay their social security tax instead of saving for their own old age so this loss in saving is never made up. In contrast, a mandatory funded plan could increase capital accumulation if it increases long-term saving beyond the voluntary point and requires that these funds be transferred to financial institutions. This, in turn, stimulates a demand for financial instruments and eventually the increased availability of these instruments. In industrial countries, PAYG systems have tended to be regressive contrary to the original intentions. This has been due in part to the way that the systems have been designed, but also because workers with higher income live longer, have a rising age income profile, and join the labor force later, thus having a shorter contributory period. Moreover, there is no equitable distribution of benefits and costs across generations: while the first generation of beneficiaries typically receives considerably more than they contributed, future retired generations typically face lower rates of return on their contributions, particularly in the case of aging populations.15 The systems have also promoted intra-generational inequities, since different rates of return may apply for contributors within a given population cohort, owing to different life expectancies (e.g., women tend to live longer). A mandatory, publicly-managed first pillar would have the limited object of alleviating old-age poverty and coinsuring against a multitude of risks. With the backing of the government’s power of taxation, this first pillar would have the unique ability to pay benefits to people growing old shortly after the plan is introduced, to redistribute income toward the poor, and to coinsure against spells of low investment returns, recession, inflation, and market failures. This pillar could take a number of forms: a universal or employment-related flat benefit, a minimum pension, or means-tested benefits. A main objective of this pillar would be to try to reduce the required contribution rate substantially and, therefore, tax evasion and misallocation, as well as pressures to overspend. It should also prevent perverse intra- and inter-generational transfers. Benefits should be set at a low level to allow other pillars to grow. A second mandatory pillar would be fully funded and privately managed, linking benefits actuarially to costs and contributions, and its main purpose would be to carry out the income smoothing or saving function for all income groups within the population. The successful establishment of this pillar (and of the third) requires the existence of a banking system and of, at least, a rudimentary stock and bond market with the capacity to develop further in response to demand from pension funds. Full funding of this pillar is expected to boost capital accumulation and financial market development. A successful second pillar should encourage economic growth that would in turn help finance the first pillar, but it will also reduce the demand for it. At the same time, the empirical evidence does not permit a generalization about the impact of the public pension system on saving. Replacing a PAYG defined- benefits public sector plan with a defined-contribution private sector plan as done in Chile may increase aggregate saving but, for this to happen, the levels of the contribution rates of the new plan and the means of financing the increase in the public sector deficit that characterizes the period of transition during which the old system is phased out are critically important. To maximize the impact of saving, the public sector deficit created as workers stop paying payroll taxes and start making contributions to the new system should be financed as much as possible through fiscal consolidation and the contribution rate to the new system should be as high as possible.21 That being said, a fiscal consolidation and an increase in payroll tax rates would raise saving anyway, with or without a switch to a funded system. It is interesting to review what has been happening to the pension systems in the transition economies because their pension systems and social spending policies were similar to those of Cuba before the demise of central planning. 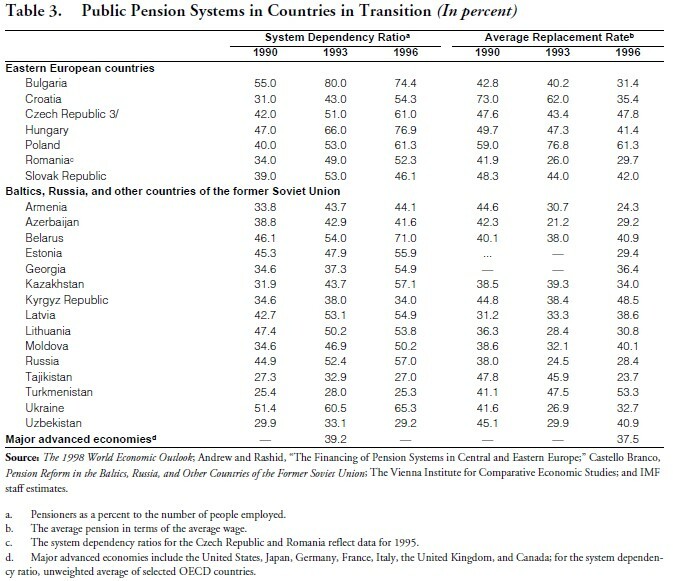 The public pension systems currently in place in the Baltics, Russia, and other countries of the Former Soviet Union (BRO) and in Eastern Europe were introduced originally as contributory pension schemes with universal coverage based on PAYG financing.23 Castello Branco notes that this scheme was part of a public welfare system designed to provide “cradle-to-grave” protection to the population, including a myriad of social protection arrangements, ranging from the provision of health and education to the delivery of subsidies, cash benefits (including pensions and various allowances) and benefits provided in kind (such as housing) as well as guaranteed employment. Under this system, pension benefits were only loosely linked to contributions, the same way wages were often unrelated to workers’ productivity. As the budgetary situation deteriorated in these countries, guaranteed employment and direct subsidies to the population were virtually eliminated, and the provision of the social benefits promised under the old system became increasingly burdensome, especially in light of competing demands from other expenditures necessary to carry forward the transition process. System dependency ratios — defined as the ratio of pensioners to working population — were already high at the beginning of the transition, and they increased further (Table 3) as employment fell, as the incidence of early retirement increased, and, in a few countries, as populations aged. Some central and eastern European countries have intentionally used early retirement and disability pensions as a safety net to prevent a sharp increase in unemployment, adding to the financial pressures. At the same time, financial weakness of enterprises, a rise in private and informal sector activities, and an inefficient collection system resulted in a decline in contributions. Most BRO countries responded to the declining number of contributors and the weakening in tax compliance by initially reducing the generosity of the benefits. During the initial, high inflation, phase of the transition period, the lack of formal indexation mechanisms resulted in a significant erosion of the real value of pensions. Subsequently, the use of sporadic indexation and modifications in the benefit formula, in particular changing the way the initial pension was determined, flattened the pension benefit structure in most countries.24 For example, the average replacement rates — defined as the average pension in terms of the average wage — fell by more than 10 percentage points in Albania, Croatia, and Romania in 1991-93 and benefit levels were also compressed in Russia. In some cases the benefit levels were reduced to just slightly above the poverty line, and in some instances below it. Pensioners in these countries seem to have survived through transfers provided by extended family arrangements, income from informal activities, and sales of personal assets. In these circumstances, Castello Branco points to the fact that these pension systems have become crude social safety nets, providing small amounts of benefits to a large section of the population. In the poorest countries, like Armenia and Georgia, the official safety nets have become largely irrelevant for household income. In recent years, with progress achieved in macroeconomic stabilization there have been attempts to increase the level of benefits but there have been insufficient funds to do this. Despite the reduced benefits, pension funds began to run cash budget deficits. Moreover, most of these countries, except Albania and some countries in the Caucasus and Central Asia, face the prospect of aging populations which will add to the financial strains of the pension systems. To address the growing financial imbalances in the pension funds, contribution rates were raised significantly. Payroll taxes are now in excess of 30 percent of wages, and they were as high as 52 percent in Ukraine in 1996. However, the increase in contribution rates apparently has discouraged compliance in a significant way. At the same time during the transition period, arrears have accumulated both in contributions and in payments of pension benefits. In addition to the short-term responses of compressing benefits (but not the number of beneficiaries), increasing contribution rates, and accumulating arrears, several BRO countries have adopted piecemeal reform measures to correct some of the distortions existing in their PAYG system. Notably, they have introduced amendments to the existing legislation to change the benefit structure and eligibility criteria, and made efforts to improve targeting of benefits and strengthen tax collection. A few countries (Armenia, Azerbaijan, Estonia, Kazakhstan, and Lithuania) have actually initiated the process of gradually increasing retirement ages, while in Georgia the retirement age was raised by five years in one go in February 1996. Some countries have reduced or eliminated benefits for working pensioners. BRO countries also are trying to improve the collection of contributions to the pension systems. To try to improve the disappointing collections of contribution rates, some countries (Armenia, Georgia, and Ukraine) have decided to gradually cut contribution rates in an attempt to increase compliance over time. Countries like Ukraine have taken steps to harmonize contribution rates by raising rates for some privileged categories, and others including Russia and Ukraine have attempted to broaden the tax base by including some previously untaxed nonwage income. A number of countries are considering more systemic pension reforms and are in some cases preparing the introduction of private pension funds. Others like Kazakhstan, Latvia, Hungary, and Poland have taken steps to adopt a multipillar system as recommended by the World Bank. The Kazakh reform plan that became operational in January 1998 envisages a transition toward a new system, based on the Chilean model, in which the first pillar will play a minimal role. All current and new workers will immediately participate in the funded system of individual accounts. In Hungary, Latvia, and Poland, the first pillar retains a more important role and continues to provide benefits partially linked to contributions. These three countries are also taking a more gradual approach toward introducing the privately managed pillars and Hungary and Poland offer those currently working and within a certain age range the option to continue participation in the old system. The shock that the Cuban economy suffered from the elimination of the subsidies of the former Soviet Union in 1989, and the impact of the accumulation of economic distortions as a result of central planning, has had serious negative consequences on the economy and on the fiscal accounts. The discussion above shows that the finances of the pension system of Cuba were also negatively affected and that pensions had fallen to very low levels in U.S. dollar terms at a time when the economy became increasingly dollarized. As in the transition economies, reforming the pension system in Cuba is in many ways a more difficult task than in industrial and developing countries. The difficult situation of the public finances, the large competing expenditure needs, and the lack of financial markets and regulatory frameworks, create very serious constraints to reform. Politically and on ethical grounds, there is a need to provide a minimum protection to pensioners who may not live to enjoy the eventual benefits from the reform of the pension system and from the improvements in macroeconomic performance, but expect the government to honor their promise of an adequate pension. To address the pension and other serious economic problems of Cuba, it is clear that a medium- to long term macroeconomic program would need to be put in place with a strong emphasis in carrying out the needed structural reforms to eliminate the distortions and generate a strong supply response from the economy. Up to now, the adjustment to the economic shock of the 1990s has been essentially from the demand side, and it is imperative to increase economic growth to raise living standards and generate resources to reform the pension system.25 With higher rates of growth in the future, the PAYG finances would improve significantly. Concerning the reform of the pension system, Cuba is faced with the double problem that the system is already running a large cash deficit which is likely to increase over time as the population ages, while at the same time the pension system does not redistribute income in an adequate amount to old people who have been poor most of their lives and now face a dismal future at the current levels of pensions. Neither does the current system provide an adequate vehicle to save a share of income of the active population for their old age needs, or provide insurance against disability or protection to survivors. To come up with specific recommendations on how to reform the pension system, more comprehensive information would be needed about the state of public finances and about demographic trends in Cuba. In a country like Cuba, there are likely to be large amounts of off-budgetary transactions that would need to be brought into the budget before one can assess the real fiscal situation and how much leeway the government has in meeting its pension obligations. At the outset of the reform of the Cuban pension system, it appears that there is little choice but to try to reform the existing PAYG system and implement piecemeal reforms to correct some of the most obvious distortions, as has been done by transition economies, as well as by industrial and developing countries. It is clear that the retirement age would need to be raised—preferably to 65 years old for both men and women, given that the latter group tends to have a longer life expectancy. Contribution rates will need to be increased, although it would be important to be mindful of the limits that exist before serious evasion problems arise; actuarial calculations will be a key input in determining by how much to increase retirement age and contributions. The rules for early retirement would need to be tightened and the targeting of the benefits improved by means-testing (except that for some time the introduction of means-testing is unlikely to have strong payoff given how widespread poverty is in the population) and stronger surveillance exercised over disability claims to reduce abuses to the system. The cost of all noncontributor benefits should be transferred to the budget and the special retirement program of the military and others should be integrated with the general pension program. A decision will have to be made about indexing existing pension benefits. Preferably, changes in pensions rather than in wages will be linked to changes in the consumer price index, given that increases of the latter will tend to reflect increases in productivity in better functioning labor markets. The more difficult question would have to be what to do about the level of pensions. One possibility would be to have instead of a basic public pension (on a universal or means-tested basis) a minimum flat rate which, while higher than the current level, would still be relatively low, plus a limited earnings related pension scheme. The option of developing private pensions (either mandatory like the World Bank’s second pillar or voluntary as in the third pillar) should not be excluded. However, it is evident that significant progress would have to be made in creating a financial system and an appropriate regulatory framework before a serious program of privatization of pensions can be considered. In this context, the reforms being implemented in transition economies, particularly the more ambitious ones of Latvia and Kazakhstan, merit close analysis by Cuban policy makers. Moreover, adopting a privatized system will have little impact in the short run in the circumstances of Cuba because the government would have no way to close the cash-flow deficit. Most, if not all, of the private pension surplus would need to go into the financing of the fiscal deficit through the purchase of government securities. 1. The views expressed here of the author’s and do not necessarily represent the official views of the International Monetary Fund. The author would like to thank Philip Gerson for useful comments and Jorge Pérez-Lopez for providing reference materials. 2. See Juan Buttari, “The Labor Market and Retirement Pensions in Cuba During the Transition: Reflection on the Social Safety Net Experience of Former Socialist Economies”; J. Alonso, R. Donate-Armada, A. Lago, “A First Approximation Design of the Social Safety Net for a Democratic Cuba”; and Donate-Armada, “Cuban Social Security: A Preliminary Actuarial Analysis of Law 324 of Social Security,” all in Cuba in Transition—Volume 4 (Washington: Association for the Study of the Cuban Economy, 1994). See also R. Donate- Armada, “Preliminary Analysis of Retirement Programs for Personnel in the Ministry of the Armed Forces and Ministry of Interior of the Republic of Cuba,” in Cuba in Transition—Volume 5 (Washington: Association for the Study of the Cuban Economy, 1995). 3. This discussion of the pension system in Cuba owes a great deal to the writings of Professor Carmelo Mesa-Lago. For a more wideranging discussion of the social security system of Cuba than contained in this section, see Carmelo Mesa-Lago, “La seguridad social y la pobreza en Cuba,” in La Seguridad Social en America Latina: Seis Experiencias Diferentes (Buenos Aires/Alemania: Konrad-Adenauer- Stiftung-CIEDLA, 1996). 4. Mesa-Lago, “La Seguridad Social y la Pobreza,” pp. 52-53. 5. Mesa-Lago, “La Seguridad Social y la Pobreza.” Cuba’s retirement age, on the other hand, is similar to that of the Baltic and former Soviet Union republics (Table 2). 6. Official figures reported in CEPAL, La economía cubana: Reformas estructurales y desempeño en los noventa (México: Fondo de Cultura Económica, 1997), Tables A-7 and A-8. 8. Mesa-Lago, “La Seguridad Social y la Pobreza,” Table 8. 9. CEPAL, La economía cubana, Table A-31. 10. Mesa-Lago, “La Seguridad Social y la Pobreza,” p. 91. 11. CEPAL, La economía cubana, Table A-14. 12. See World Bank, Averting the Old Age Crisis: Policies to Protect the Old and Promote Growth (1994). 13. World Bank, Averting the Old Age Crisis. 14. World Bank, Averting the Old Age Crisis, pp. 9-10. 15. See Marta Castello Branco, Pension Reform in the Baltics, Russia, and Other Countries in the Former Soviet Union, IMF Working Paper 98/11 (February 1998). 16. World Bank, Averting the Old Age Crisis. 17. For a more thorough discussion of the choices to be made in establishing the three pillars, see World Bank, Averting the Old Age Crisis, pp.17-18. 18. See Federal Reserve Bank of St. Louis’ Review (March/April 1998) for a discussion of current proposals for reform the U.S. social security system which includes provisions for tightening of benefits and setting up individual retirement accounts. 19. Peter S. Heller, Rethinking Public Pension Reform Initiatives, IMF Working Paper 98/61 (April 1998). 20. Richard Hemming, Should Public Pensions be Funded?, IMF Working Paper 98/35 (March 1998). Hemming argues that a case could be made for the funding of public pension systems if it can be demonstrated that it results in greater inter-generational fairness, if it can better handle demographic and economic risks, if it can more clearly signal future pension costs, or if it is associated with higher saving. 21. G.A. Mackenzie, Philip Gerson, and Alfredo Cuevas, Pension Regimes and Saving, IMF Occasional Paper No. 153 (August 1997). 22. Lawrence Thompson, Older and Wiser: The Economics of Public Pensions (Washington: The Urban Institute Press, 1997). 23. This section is based on Castello Branco, Pension Reform in the Baltics, Russia and Other Countries of the Former Soviet Union, and on Box 10 of the 1998 World Economic Outlook of the International Monetary Fund. 24. Castello Branco, Pension Reform in the Baltics, Russia and Other Countries of the Former Soviet Union, pp. 28-29. 25. See Lorenzo L. Pérez, “The Implications of Good Governance for the Reconstruction of Cuba,” in Cuba in Transition—Volume 7 (Washington: Association for the Study of the Cuban Economy, 1997), for reforms that need to be implemented to promote an economic recovery in Cuba.